... so I had to use the window. The sunshine is bright enough - as long as I remember to work during the day when the clouds are not gathering! 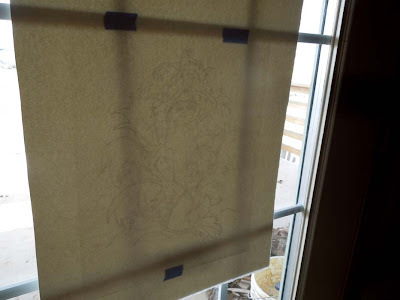 I have been working on transferring drawings on tracing paper to watercolor paper. The watercolor paper was a bit thick for my lamp to shine through, so I thought I would try this. It has worked great! Now... off to put a few finishing touches on the drawings and begin painting! What a great idea Kathleen. I may try something similar. Thanks, Pamela. This has worked very well with the watercolor paper. Hooray for the sun. The window is my usual "light box," too. It's great that this technique worked so well! Thanks! Yes, I was really pleased that it did. I've used this technique before for dry embossing as well. Thanks! I was really glad that this worked as well as it did. What fun - I did a little bit of embossing many years ago. Good to improvise... glad it is working well!